Are you a fan of British band The Vamps? Have you recently discovered this exciting new group or seen them perform as supporting artists? Can you name all the tracks on their debut album? If you think you know about Bradley, Connor, James and Tristan or would like to find out more, you are certain to enjoy The Vamps Quiz Book. Which boy band did The Vamps support in the UK and Ireland on their ‘Word of Mouth’ world tour? In what year was the band’s debut single released? Which American actress and singer featured on the band’s song ‘Somebody to You’? The answers to these and similar questions can all be found inside. This book contains100 brain-teasers about The Vamps and includes singles, debut album, tour dates and awards as well as many personal details about each band member. 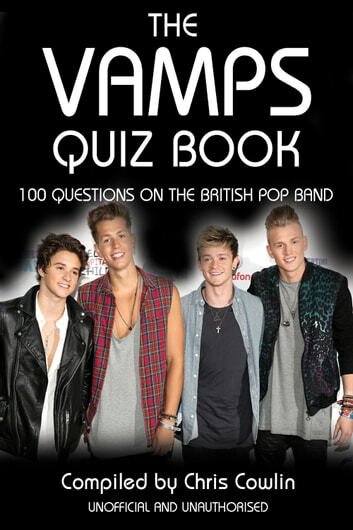 If The Vamps is currently your favourite band you won’t want to be without this quiz book detailing the early days of the band’s promising career in pop. The Vamps: Facts, Quizzes, Quotes ‘N’ More!